Sterling Silver 16-18 inch, 1.4mm Flat Cable Extender Necklace with Spring Ring Clasp and 2 inch, 2.5mm Flat Cable Extender at the back. 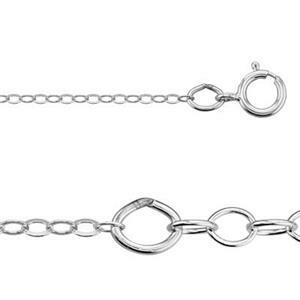 Customers love these adjustable chains! Wear the same necklace with different tops and select your own length. Add a dangle charm at the back for extra adornment.